Bicycles were splayed across the roadway through Dupont Circle in the District and drivers honked during a "ghost rider" vigil Wednesday night near where a 20-year-old man was killed while riding his rented electric scooter. WASHINGTON — Bicycles were splayed across the roadway through Dupont Circle in the District and drivers honked during a “ghost rider” vigil Wednesday night near where a 20-year-old man was killed while riding his rented electric scooter. Bike safety advocates staged the protest, calling on the District to institute traffic infrastructure improvements to protect scooters, bicycles, and personal mobility devices. Carlos Sanchez-Martin, 20, of Silver Spring, Maryland, was riding on a scooter going westbound at Massachusetts Avenue NW, when he was hit and pinned by a BMW X3. 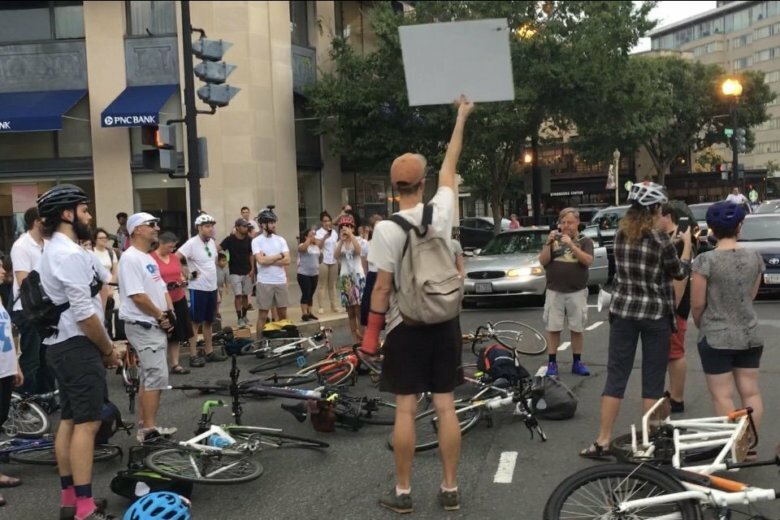 Wednesday evening, several dozen protesters laid their bicycles down and stood in the roadway as nearby drivers honked — some in frustration, some in solidarity. “Nobody should lose their life traveling across D.C. — period,” said Rachel Maisler, a representative of the D.C. Bicycle Advisory Council, which organized the “ghost ride” protest. Maisler and other protesters are calling on the D.C. government to build protected infrastructure for scooters, bicycles and personal mobility devices. “We need raised crosswalks and pedestrian crossing times that are adequate to allow someone to cross all the travel lanes to get out of the circle, without getting stuck on one of the islands, as cars whiz past them,” Maisler said. J. Swidersky said non-car-drivers are at the mercy of confused drivers as both try to navigate Dupont Circle. “People making all kinds of turn movements, they don’t know where they’re going,” said Swidersky. Although the District has many miles of bicycle lanes, Maisler argues more needs to be done. “That gives cyclists a false sense of security, and that gives drivers, also, the idea that cyclists are more secure than we really are,” she said. The D.C. Council is holding a transportation and public safety roundtable Thursday afternoon at 1:30 p.m. to talk about improving cyclist and pedestrian safety.